Arenaria grandiflora L. var. bolosii Cañig. 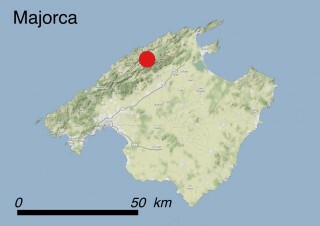 This species is only known from a single mountainous area on the island of Majorca in the central part of the Tramuntana mountain range. Less than 200 individuals grow in an area covering approximately one hectare. It is very sensitive to competition from other species and therefore grows in open areas with little soil cover. 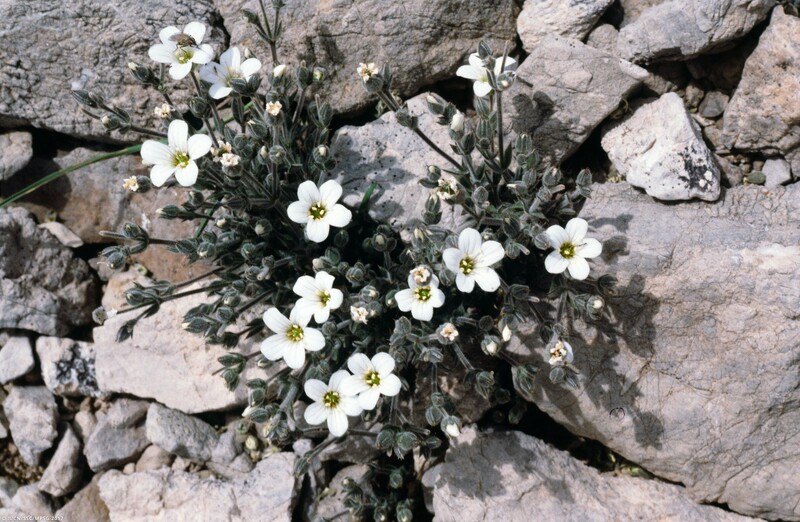 It is found on north-facing slopes above 900 m of altitude. Its habitat is a very patchy garrigue on stony and rocky substrate, characterized by spiny cushion-like shrubs, subshrubs and herbs (code 3.8.2: Garrigue). This perennial herb grows in loose clumps, up to 5-10 cm tall. The plant, green-grey tinged with pink, is branched out from the base with stems covered by small hairs. The leaves are arranged in pairs, lanceolate to linear. 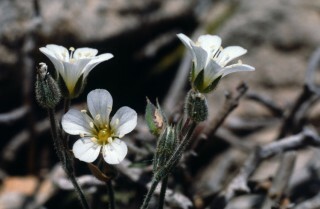 The small white flowers have five petals and develop at the tips of the stems. Flowering and fruit production occur between June and July. A. bolosii can be confused with the related A. grandiflora L. subsp. 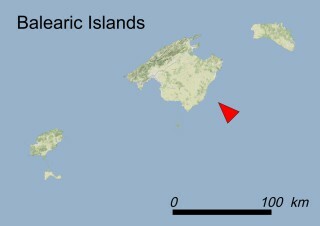 glabrescens, a taxon which can be assigned to low concern category, co-occurring in the same site as well as on other mountain ranges of the island. A. bolosii differs by its grey color and compact habitus, the dense 0.2-0.4 mm glandular hairs on the inflorescence indumenta (A. grandiflora subsp. glabrescens may also bear glandular hairs, but these are less dense and shorter than 0.2 mm) and the smaller seeds (1-1.2 mm vs. 1.3-15 mm in A. grandiflora subsp. glabrescens). Apart from its perennial habit, little is known about the biology of this plant. 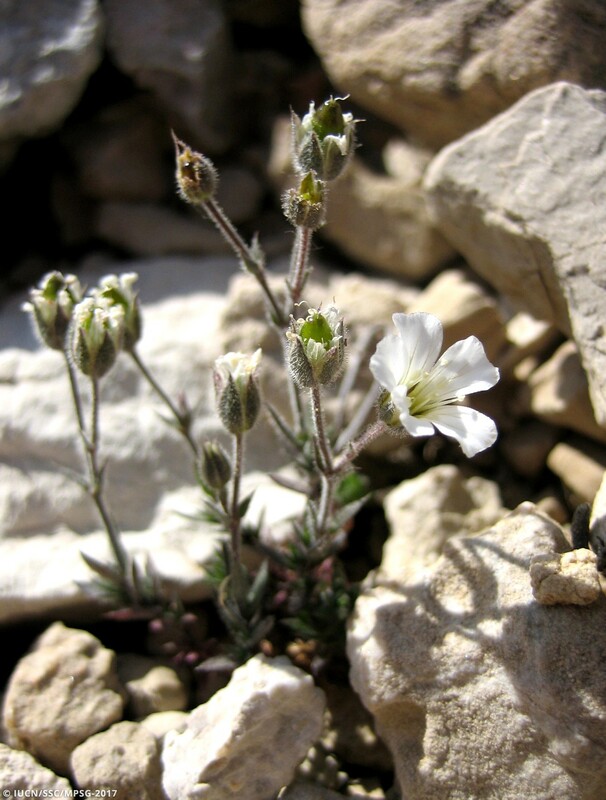 Its small size and the buds close to the ground protect it from the wind and allow it to withstand the dry microclimatic conditions. A. bolosii is categorized as CR (Critically Endangered) according to IUCN Red List Criterion B1ab(iii)+2ab(iii). This means that the number of individuals and the surface of suitable habitat are both very small, as it is known from two sites prone to frequent disturbance due to hikers and goats, which undoubtedly affect the stony ground. The main treats are: Plant collectors seeking botanical rarities (threat 5.2.1: Gathering terrestrial plants - Intentional use). In addition, the species seems to hybridize with the closely related species A. grandiflora subsp. glabrescens (threat 8.2.2: Problematic native species/diseases - Named species). Other threats include grazing by goats (threat 8.2.2: Problematic native species/diseases - Named species), and habitat modification as people use the area for hiking (threat 6.1: Recreational activities). 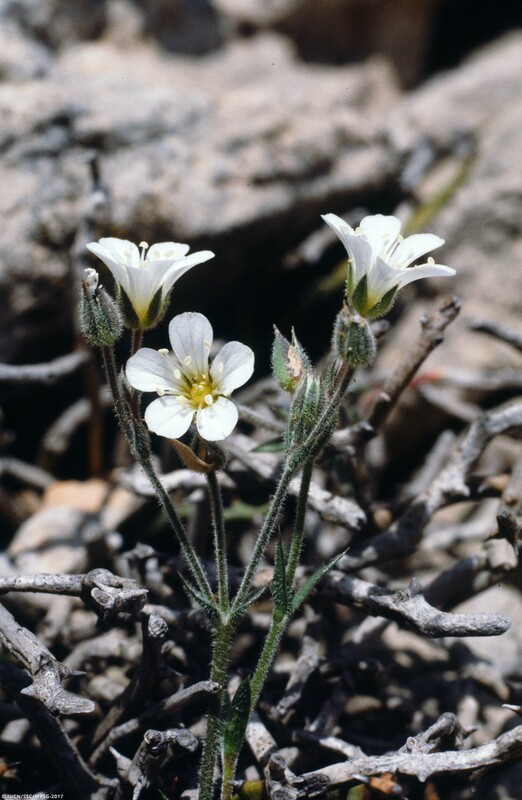 The potential impact of fires affecting Arenaria patches (threat 7.1.3: Fire and fire suppression – Trend unknown/unrecorded) should not be underestimated. 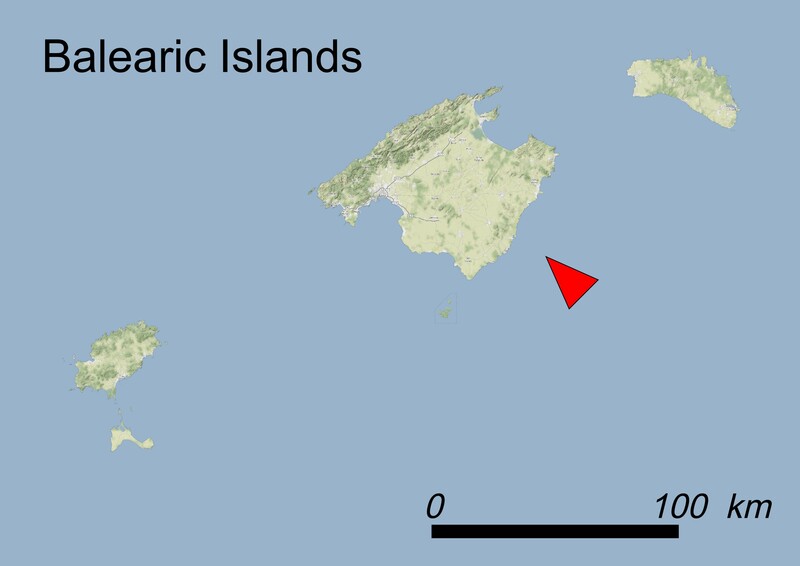 Legally: the site hosting the population of A. bolosii falls within the Natura 2000 network (ES5310027 ‘Cimals de la Serra’) set up under the autonomic legislation (Official Bulletin of the Balearic Islands 38, 16/03/2006 and 47 ext., 01/04/2006). The site also falls within a Natural Area of Special Interest (ANEI de Tramuntana) and the Serra de Tramuntana Nature Area. To the last one the status of “Integral Natural Reserve” has been recognized according to the Official Bulletin of the Balearic Islands 54 ext., 11/04/2007). The species is protected at a Regional level (BOIB 66, 15/05/2008) and listed as Vulnerable. In situ: No measures have been taken yet. There is a lack of regular monitoring and population census. Ex situ: Seeds of this plant are stored in the seed bank of the Botanical Garden of Sóller in Majorca, but it is possible that these are hybrids with A. grandiflora subsp. glabrescens. This species needs increased legal protection, such as its inclusion in the Annexes of the EC Habitats Directive. Public access to the site must be controlled effectively and a clear delimitation of the walking paths is needed. Moreover, more information on forbidden activities such as picnic, camping, gathering or walking outside of the paths should be given to groups especially as concerns the use of the walking path (GR-221) which passes through the population. Other conservation measures to be taken must include the introduction of the species in other areas of the Majorcan mountains, but carefully avoiding the vicinity of the other Balearic congener species. If the seeds stored in seed banks are found to be hybrids, any re-introduction campaign using this material will be detrimental to conservation. Genetic studies are therefore needed, and seeds should be collected only when it has been established that they belong to this species. Sr. Pere Fraga i Arguimbau, Island Council of Menorca. Dr. Eva Moragues, Government of the Balearic Islands. Dr. Llorenç Sàez, Autonomous University of Barcelona.